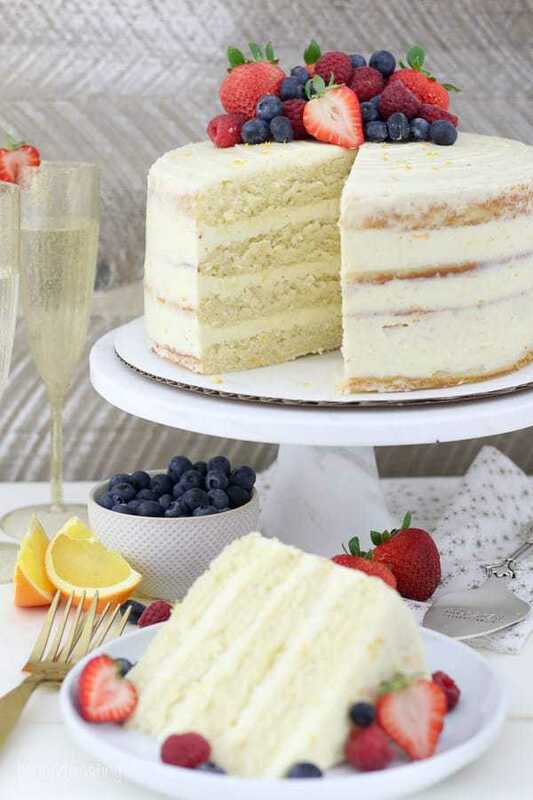 Whether you’re celebrating the holidays or not, this Mimosa Cake will be a crowd pleaser. 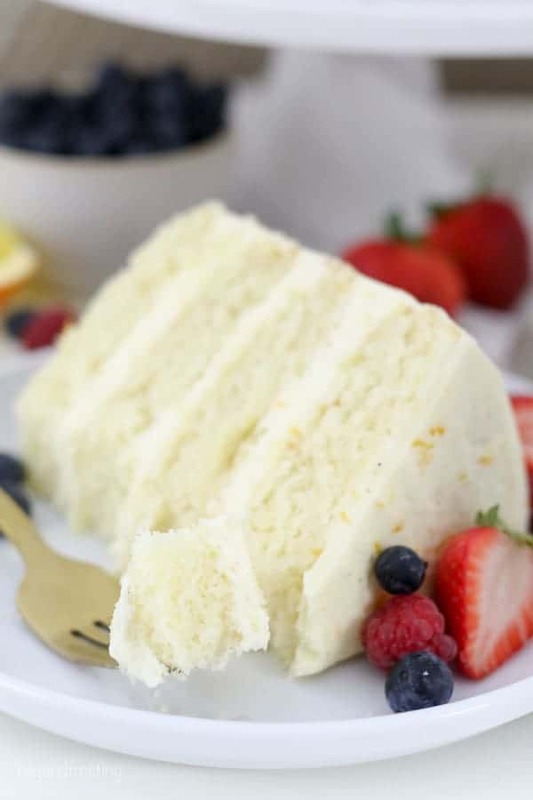 This cake is a moist champagne sponge cake with an orange Swiss meringue buttercream frosting. This post is sponsored by Silpat. The contributor received a Silpat for review and was compensated for recipe development. All opinions are her own. Nothing says “I’m ready for the holidays” more than a Mimosa Cake. While I’ve shared numerous champagne-flavored treats on my blog, I have a major crush on this cake. 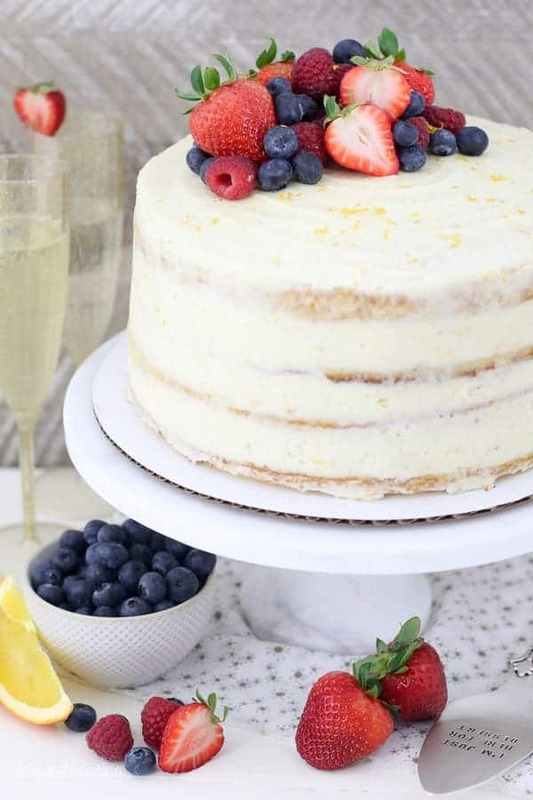 This Mimosa Cake is a moist champagne sponge cake with an orange Swiss meringue buttercream frosting. The cake itself is an adaptation of my moist vanilla cake; I’ve swapped out regular milk for buttermilk and champagne. I also added a bit of orange zest for flavor, but a majority of the orange flavor is actually coming from the buttercream. I don’t often use Swiss meringue buttercream because it is a bit more labor intensive but the results are well-worth it. The buttercream is silky smooth, much less sweet than traditional American buttercream and the buttery flavor actually really complements the cake. It’s one of my favorite frostings to eat. I have a whole post dedicated to tips for making Swiss Meringue Buttercream because it can be intimidating at first. If you read through these tips and the full instructions of the recipe prior to starting, you’ll be just fine! You’ll notice I call out for vanilla bean paste in the recipe. This is definitely a premium ingredient but it can easily be swapped out for vanilla extract. I just love the little speckles of vanilla bean in the buttercream. Since this is such a large cake, I’m not exaggerating when I say you will need a lot of butter! Traditionally, I make 8-inch cakes with 3 layers, but today I’m serving up a 4 layer 9-inch cake and there’s good reason! My favorite baking tools in the kitchen are my silicone Silpats which I use for baking everything from cookies and brownies to potatoes and vegetables. 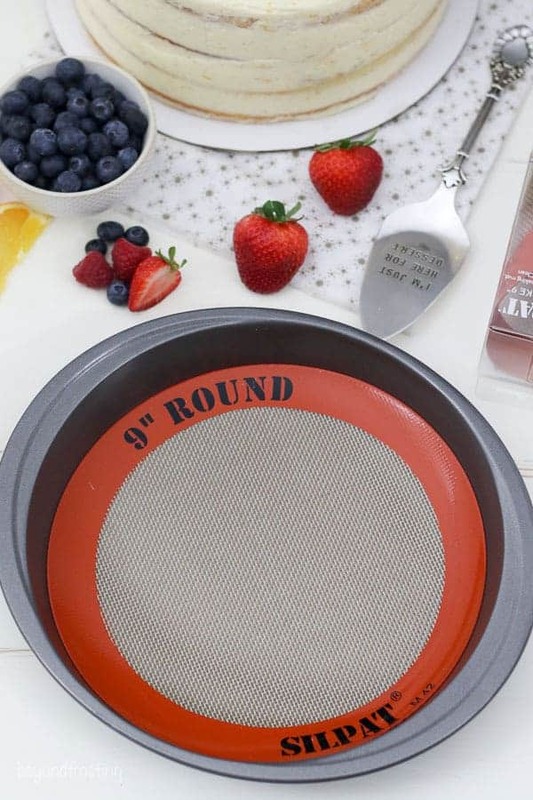 Silpat is now offering a 9-inch round baking mat which is AMAZING if you make as many cakes as I do. Previously, anytime I would make a dessert in my springform pan or even when baking cakes, I would always line the bottom of the pan with parchment paper so that the crust wouldn’t stick to the pan. Now, I can stop wasting all my parchment paper and start using my Silpat! However, it does not sit perfectly in the bottom of my 9-inch baking pans. After trying several different brands of 9-inch pans, I’ve determined that this is a bakeware manufacture issue because the bottom on the pans aren’t actually a true 9-inches wide at the base. I also noticed the sides of the pan are not completely straight which explains why these cakes sometimes turn out oddly shaped. In order to use these 9-inch Silpats in my 9inch baking pans, they had to wrap up the sides of a pan a little bit, but that actually helped me slip my knife underneath to get the cakes out of the pans once they were baked. I baked my cake using 9-inch Silpat rounds and not only did they prevent to bottom of my cake from browning, it also made it much easier to get the cake out of the pan. However, these Silpats fit perfectly in my 9-inch springform pan which is what I use most for cheesecakes and no-bake desserts. I foresee myself ditching the parchment paper and using these Silpats from now on! For this 4-layer cake, I baked 2-layers at a time, allowed the cakes to cool for about 10 minutes and then reused the pans to bake the second two layers. If you happen to have four 9-inch pans, you can make them all at the same time but I’d expect that you would need to rotate them halfway through baking, and your baking times might be increased. If you make a double batch of the cake batter, some of your batter will be sitting out while your first two layers are baking, you should remix the batter before filling your pans the second time as the batter can separate if it has been allowed to sit for too long. Also, be sure to scrape the bowl prior to remixing to get anything off the bottom of the bowl mixed into your batter. There is just enough frosting in this recipe for a rustic crumb coating, so I’ve garnished it with fruit. One suggestion I have to get your fruit to stack nice and high is to put a dollop of frosting under the fruit (directly on the surface of the cake) and then use that like a “glue”, sticking your fruit up against the frosting and building from there. 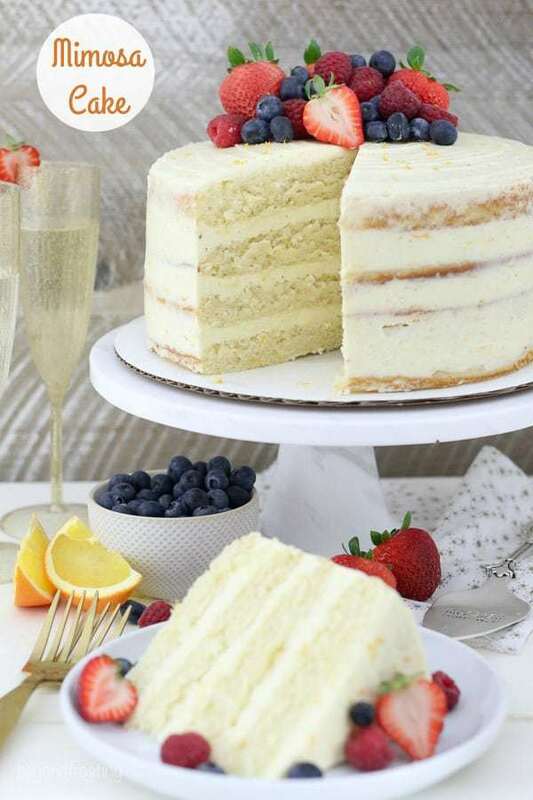 Now go grab an extra-large plate for this Mimosa Cake. I was so happy to stumble across your wonderful site today! 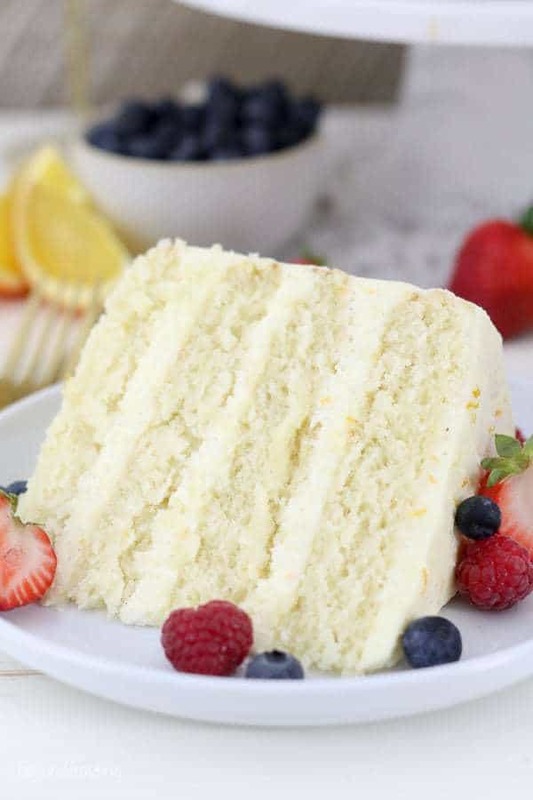 Just wanted to give you a little tip/info after reading this mimosa cake post (which I will be trying very soon!). If you want straight sides on your cakes, I highly recommend looking into purchasing a “professional” cake pan line. I’ve tried most of them, and my favorite is the Parrish Magic Line. They are durable, conduct heat evenly, and have straight sides! Fat Daddio’s are also great. I like the option of 3″ high sides with both brands. It’s amazing what a difference it makes when decorating. Thanks for your amazing site! Hi Janene, thank you so much! This seems to be mostly a problem with the 9-inch pans, because they are not straight to begin with. I totally agree with you on a professional line of baking pans! Happy baking! I’ll gladly find a reason to celebrate if it means I get a slice of this cake! 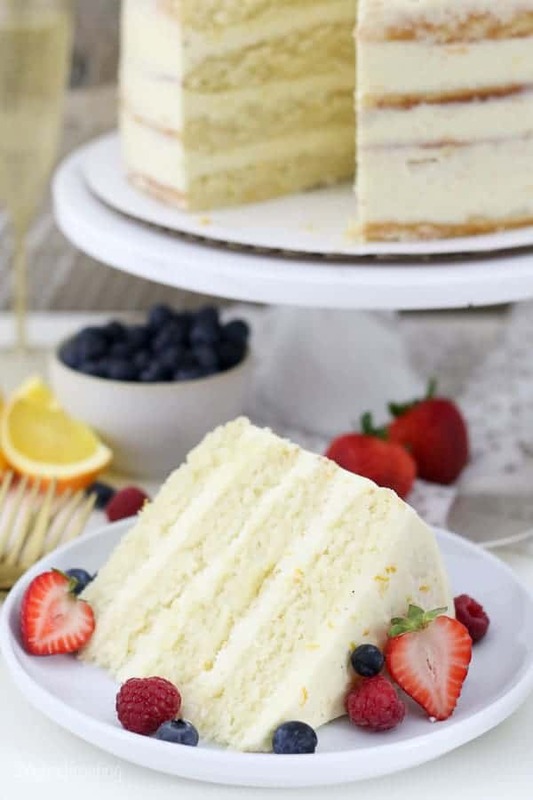 Love the idea of bringing that familiar mimosa flavor to cake – yum! I didn’t realize they made round silpats! I’m so excited to try them! What a fun idea for a holiday brunch!! I never knew there were round silpats for cakes! This is definitely a game changer. I’m ordering two right now! Thank you so much!! And this cake looks incredible as well. Awesome!